Unlike Gone with the Wind and Dark Victory, The Wizard of Oz was part of the Hollywood film-musical tradition. In Oz there are obvious, diegetic musical numbers such as “Somewhere Over the Rainbow” and “Ding Dong, the Witch Is Dead,” and also passages of non-diegetic background music. Two of the latter passages include dramatic vocalization. The second instance of dramatic vocalization in Oz occurs as Dorothy (Judy Garland) steps from the sepia-tone world of Kansas (striking for its evocation of the drabness of the Depression and Dust Bowl era) and enters the land of Technicolor. The wordless chorus sounds as signifier of the supernatural realm she has stepped into. It is unclear who was responsible for the musical sections containing dramatic vocalization. An examination of the “Musical Program,” however, presents some evidence. Dorothy steps from the sepia-tone world of Kansas into Oz, i.e., the world of Technicolor. 1 “Main Title,” Disc 1, The Wizard of Oz, special ed. DVD, directed by Victor Fleming (1939; Burbank, CA: Warner Home Video, 2005). 2 Many other films use wordless vocalization in their opening credits to foreshadow the “surprise” yet to come. See The Ox-Bow Incident (1942), The Robe (1953), The Abyss (1989), and Mars Attacks! (1996). 3 Aljean Harmetz, The Making of The Wizard of Oz (New York: Alfred A. Knopf, 1977), 89. 4 Ibid., 92. Max Steiner and Erich Korngold, both at Warner Brothers, and Alfred Newman at Fox were considered the best of the screen composers. 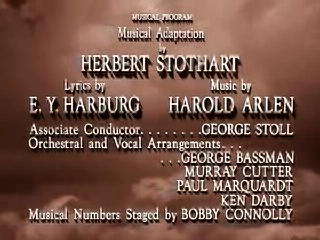 Steiner won three Academy Awards; Korngold, one; and Newman, nine. Stothart’s only award was for The Wizard of Oz.